Dozens of Israeli soldiers invaded, on Wednesday morning, Jabal a-Mokabber neighborhood, southeast of occupied East Jerusalem, and attacked a Palestinian family, causing several injuries, before demolishing their home. 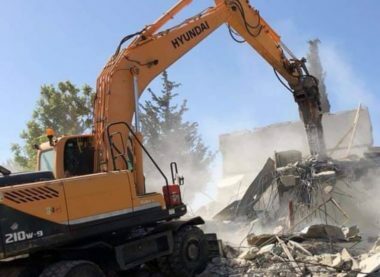 The Wadi Hilweh Information Center in Silwan (Silwanic), in Jerusalem, said the soldiers demolished the 100 square/meter home of Khalil Za’atra, reportedly for being built without a permit. Za’atra lived in his home along with eight members of his family; most of them are children, who were all rendered homeless. The soldiers attacked Za’atra and his family, causing various cuts and bruises, while forcing them out of their home before demolishing it. The home was built four months ago, and the family never received a prior warning until the army stormed their homes, the Maan News Agency has reported. 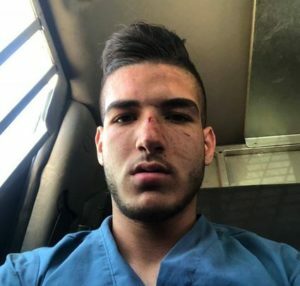 On Tuesday evening, the soldiers abducted a young man, identified as Adham Sabta, from the al-‘Isawiya town, in Jerusalem, and assaulted him, causing various cuts and bruises.